The eastern, lowland region of Slavonia used to be a favorite among Croatian and Austrian-Hungarian aristocrats. Today, their gorgeous manors remain great attractions, providing insight into a life of luxury and wealth. Here are a couple of them we picked for you to read about! The splendid baroque Turković Castle in the city of Kutjevo is named after the nobleman Vjenceslav Turković. The complex is built on the grounds of a 13th-century abby, with a fascinating wine cellarthat’s kept from that period. It was home to Jesuit priests in the 18th century, who built the three-wing residence, church and several outbuildings, before Turković bought the land some hundred years later. The Kutjevo area is well-known for its wine. A local legend (or better yet, juicy gossip) says that Austrian baron Franz von der Trenck and Maria Theresa, the only female ruler of the Habsburg Empire, met secretly in the above-mentioned wine cellar to make love, lured by the Kutjevo wine’s aphrodisiac qualities. They reportedly didn’t leave the premises for seven days! Of course, this had to be kept a secret by their servants, but the story obviously got out. The Pejačević estate in the centre of Našice sits northeast of Kutjevo and it has two beautiful castles, with an equally appealing park. The first one, or The Great Castle as the nobles of count family Pejačević called it, was built in the beginning of the 19th century. It was improved and reconstructed through time, especially after it suffered an earthquake in 1817. While the first is representative of late baroque, the second one or The Small Castle is more of a neoclassicist building. They’re both pretty admirable achievements, surrounded by a magnificent garden covered in oak, maple, pine and chestnut trees. The most famous family member that resided here was Dora Pejačević, a renowned Croatian composer who lived at the turn of the 19th and 20th century. 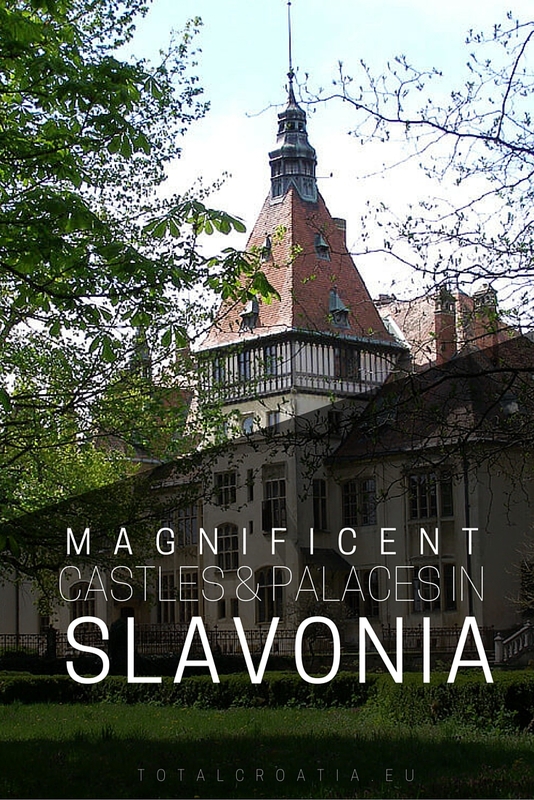 One of the oldest and largest castles in Slavonia is located in the town Valpovo, east of Našice. A Middle-Age fort from the 15th century was luckily spared after the Ottoman Empire invaded the region. Along with a late-gothic chapel, the fort’s walls were rebuilt, eventually turn into a baroque castle in the 18th century. It’s named after two Austrian noble families who owned it: first the Prandaus and then the Normanns. A unique blend of different epochs makes this complex one of the most important historical monuments of the region. Also, there’s an unresolved mystery behind it. In the first half of the 19th century, an Austrian lieutenant, who was a guest of baron Prandau, became ill. He claimed to have a vision of a white lady beside his bed during the night, saying she was murdered a hundred years ago and buried in the yard near the city chapel. She told him that if he dug her up and buried her properly, he would get well. He rushed to tell this to the baron, but apparently left out one part: she also told him where to find hidden treasure. When the baron ordered his servants to dig where the lieutenant said they would find her, they indeed saw bones in the dirt! They then made a proper burial ceremony for her remains, but the lieutenant apparently disappeared and they never saw him again. To this day, it’s still not clear if there actually was treasure buried somewhere on the castle grounds, and if the lieutenant really found it. Donji Miholjac is located right by the Croatian-Hungarian border, north of Našice. The land where the Hilleprand-Mailath palace can be found today was first owned by the Hilleprand von Prandau family in the 19th century (the same ones from Valpovo). The Austrian Prandaus married their daughter Stephanie to Georg of the Hungarian count family Mailath. By joining the couple, Mailaths acquired the baroque castle and started upgrading it at the beginning of the 20th century. The palace is richly decorated in the neo-gothic style, with great attention to detail. It has a great hall in its centre, with 50 rooms included in the vast complex. The Mailath estate also has a huge garden, where flower exhibits were held with distinguished European guests. Stephanie’s well-known fondness for daisies resulted in the fact that drainage pipes with hot water were laid down in the ground, so daisies started growing already in the winter! There are many others scattered around which we will write about in time, so be sure to check out our site regularly. Thanks for reading!